Since I could get a lift to Tuaran, I’ve decided to visit the Shangri-La’s Rasa Ria Nature Reserve to watch the Orang Utans. It’s located in KK. So for those who do not have the time to go to the Sepilok Orang Utan Rehabilitation Centre in Sandakan, you may opt to give this place a visit. 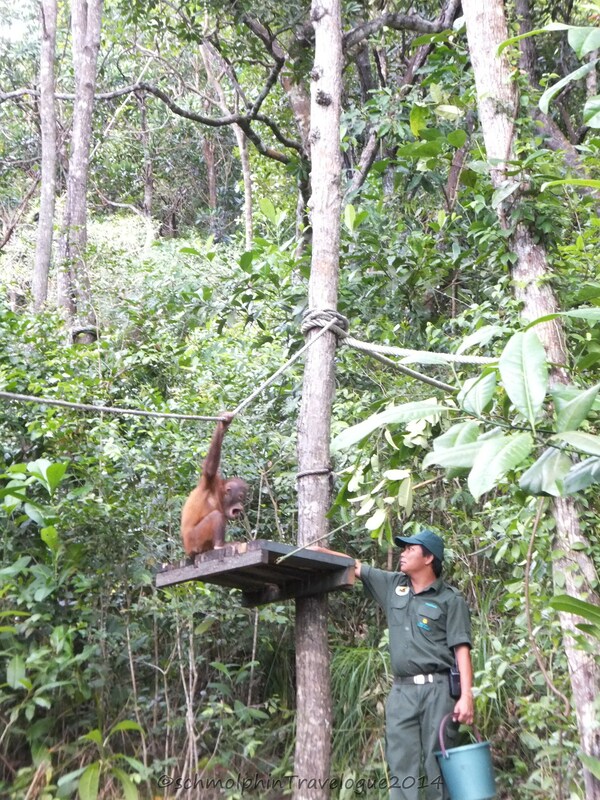 The purpose of this Rehabilitation Centre is to conserve and provide the rescued lost or orphaned Orang Utans a place for them to get use to their Natural Habitat in a safe and secured environment where their health will be closely monitored as well. Some of these Orang Utans are babies or as young as 1-2 years old. They will be place in the Shangri-La Rasa Ria Rehabilitation Centre for atleast 4 years for the First stage of Rehab before passing over to the Sepilok Rehabilitation Centre in Sandakan for their Final Stage of rehab. The Centre also aims to educate and provide schools and public on the importance of preserving these endangered Orang Utans. The entrance fee for Orang Utan feeding is priced at RM65 for foreigners and Malaysians only need to pay about RM25 if I’m not mistaken. There are only 2 time slots available. One in the morning at 10am and another in the afternoon at 2pm. I got a slot for 2 pm. We have to walk along a path and trek a little via the Orang Utan trail. 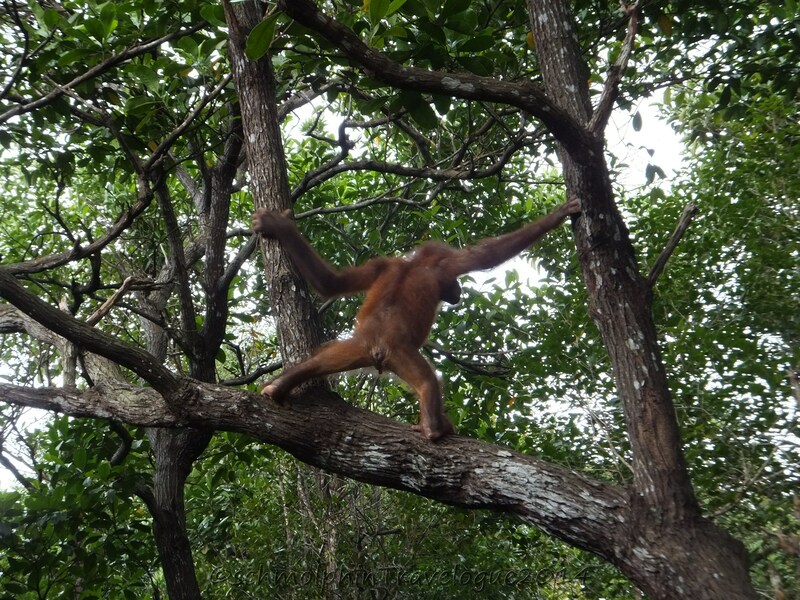 There was a slight drizzle that day and 2 out of 3 Orang Utan showed up. There isn’t any shows. It was just a spontaneous reactions from the Orang Utans if they decide to show up once they hear the voices of the rangers and crowds. If you are staying in this resort, your child can participate in the ‘Little Ranger’ activity where they will be taught how to prepare food for the different types of animals available and get some knowledge as a Ranger. The first orang utan came in from the forest, swinging from tree to tree, ignoring us and just walking over to the feeding area where the rangers have prepared boring food for them. Yes, it’s supposed to be boring food so that they won’t have to depend on the rangers for food. 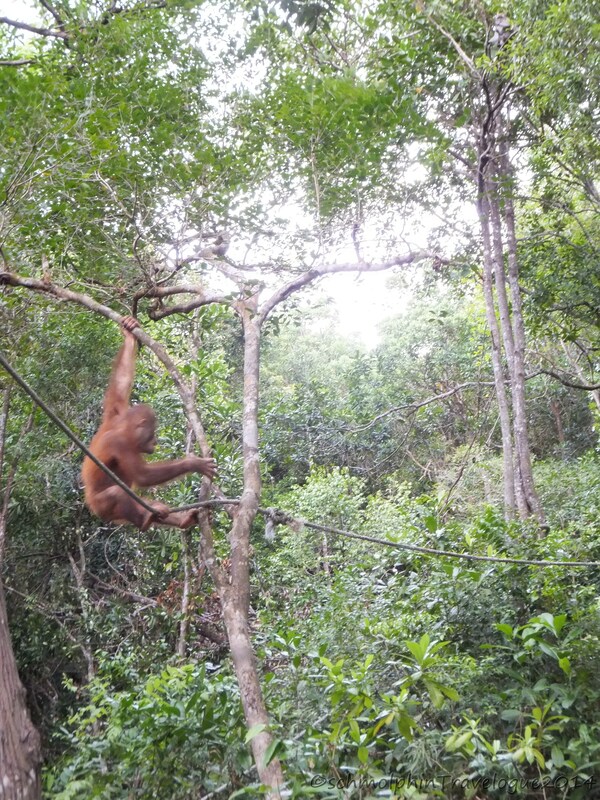 This is to encourage the Orang Utans to forage for their own source of food in the forest. 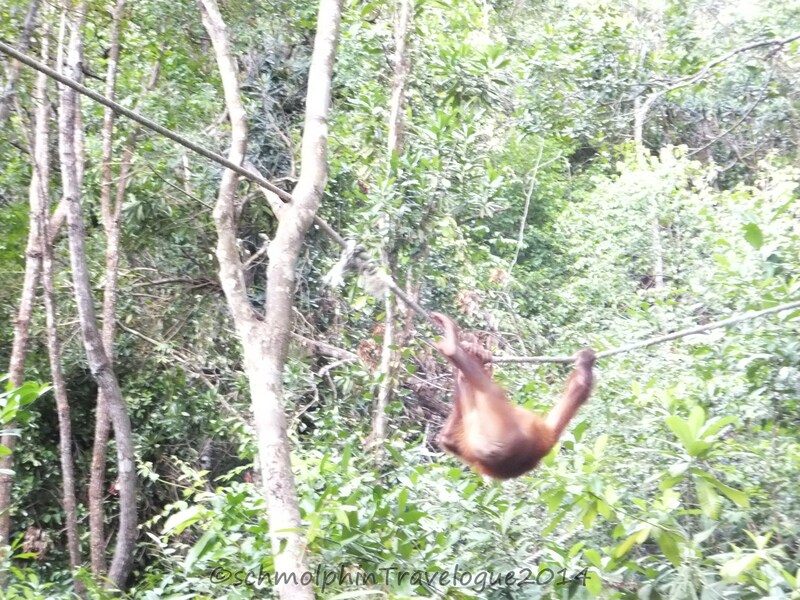 Here’s more photos of the Orang Utans while eating and I just love some of these shots I’ve captured. I hope you enjoy looking at it too! And here’s the cheeky and naughty macaque who will always appear when there’s food. I couldn’t stop smiling looking at the way this Macaque sits. Super like a boss with a heck care attitude. 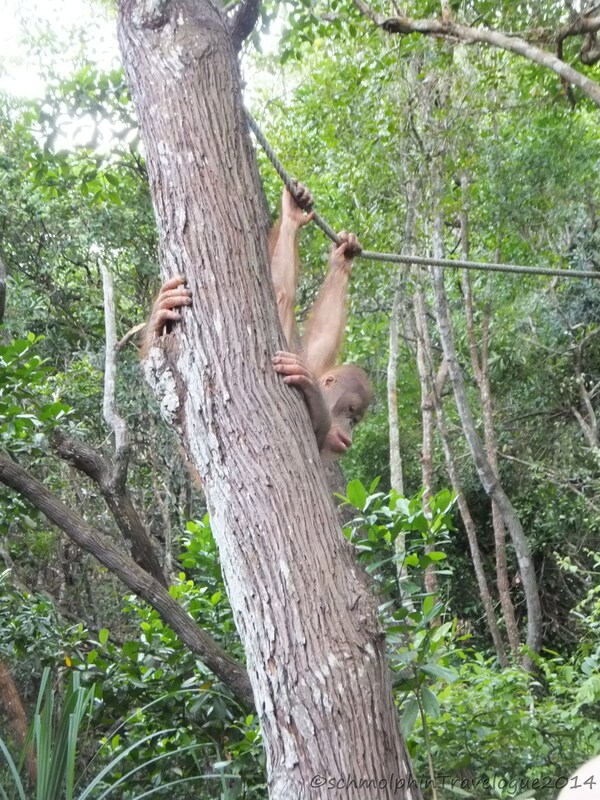 Once the orang utans has filled their stomach, the play begins… The short chase of the Macaques, the swinging from tree to tree, stop and pose at the visitors. I’m amazed at their intelligence. You can take a mini bus to Tuaran and probably alight somewhere where you can get a taxi easily that can bring you in to the Resort (just ask the driver and they will be happy to assist you) or take a cab from KK which cost RM80 per cab. 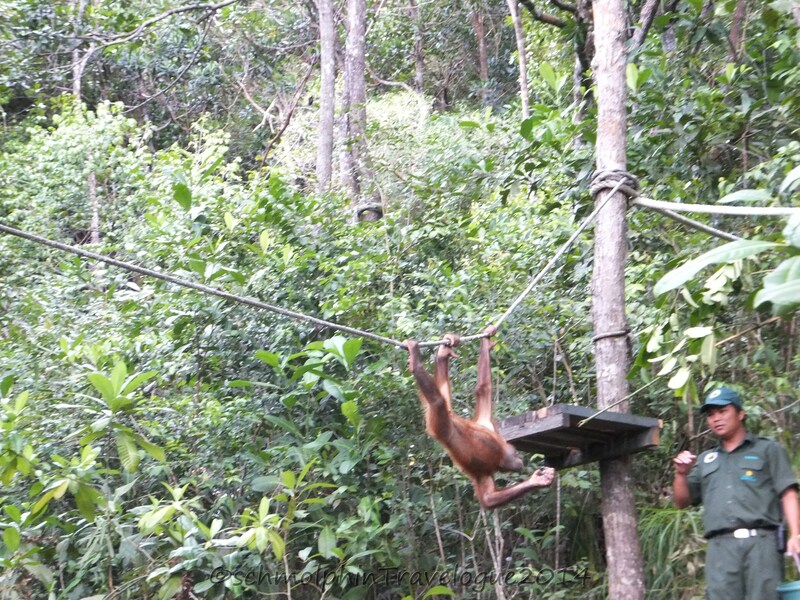 Some companies charge RM180-220 per pax for a trip to Shangri-La’s Rasa Ria Orang Utan Rehabilitaion Centre. If you hate the hassle of an un-arranged trip, then it’s best to take up the package but try to negotiate for the best priced possible. And here’s my favourite shots so far. All in all, it was a great day. I had a great time watching their spontaneous antics in their own natural habitat. 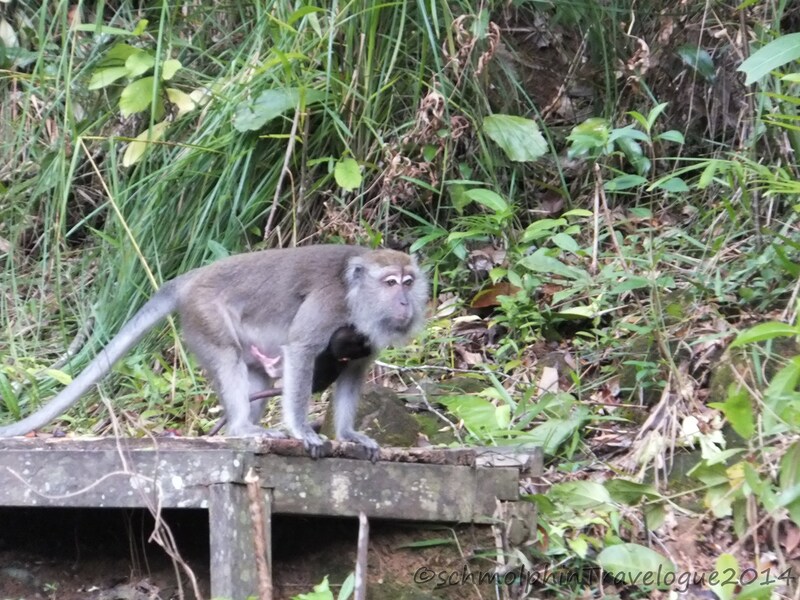 Their behaviour towards the Macaques are nothing aggressive. They are pretty quiet compared to the Macaques and the environment they are in seems to be in a well kept conditions and I’m just contented that they are safe. Most importantly, it’s where I met a cute guy who I’ve befriended named Alberto from Spain. I’m glad that I got a new friend to experience this moment together. Initially I thought the price was a little too steep but upon realisation that this is a rehabilitation centre for the lost and orphaned Orang Utans who has been rescued from various locations, I decided that the price means nothing. I’m just too happy to see that they are well taken care of and in a healthy state. That is much more important since we need to preserve them from extinctions. Great job, Shangri-La Rasa Ria. Thank you for rescuing and placing them in a safe environment to prepare them for the real life out there. That’s it for my first post on my Sabah Trip! Lookout for more coming up! Thank you for dropping by!